After their goodwill mission is attacked by the Vietcong, the remaining survivors escape in their yellow schoolbus. A short distance down the road, their bus is commandeered by Sgt. Dixie (Daniel Stephen) and his two-man squad of American Marines. The missionaries, which includes three women; Ronny (Don Gorden Bell), a nervous man; Debrard (Steve Eliot), an Australian soldier and a VC Major named Kutran (Ernie Zarate), form an uneasy alliance with the American soldiers as they make the perilous journey behind enemy lines to freedom. Running low on gas, the soldiers raid an enemy depot looking for some fuel, not knowing that the sweaty (and possibly traitorous) Ronny has reserve gas hidden under the bus. While the soldiers are on the raid, Ronny fuels up the bus and tries to take off, but is stopped by Debrand and Major Kutran. Sgt. Dixie and his men, Gus (Romano Kristoff) and Ben (Urs Althaus), become pinned-down at the enemy depot, but the bus, driven by Major Kutran, comes to their rescue. They manage to get the gas and blow up the enemy depot, thanks to the Major's help. Their next obstacle is a bridge they need to cross that is guarded by enemy soldiers. Ben comes up with a plan and it goes off without a hitch (they manage to kill dozens of enemy soldiers with no casualties on their side), which earns them respect from the Major (he salutes the soldiers for their bravery). They next happen upon a field of dead American soldiers, all of them crucified and boobytrapped. Since they can't bury them, Sgt. Dixie blows them up (the film's most affecting scene). They find a cave to hide the bus in while the soldiers check out a village with an American helicopter in the middle of it. They find all the American soldiers dead (one body is riddled with steel nails!) and then realize that the enemy was waiting for them. Everyone manages to escape alive, thanks again to the Major and Ronny, who proves to be no traitor. They next stop at a deserted VC village, where Major Kutran finds a radio and calls for help. Instead of being saved, our ragtag group of soldiers and civilians must fight for their lives when enemy soldiers intercept the Major's transmission and not everyone will make it out alive. War is truly hell and hell is for heroes. Directed with much pyrotechnics and a surprising amount of humanity by Fernando Baldi (COMIN' AT YA! 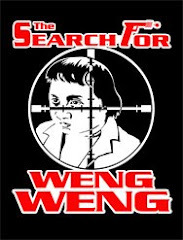 - 1981; TREASURE OF THE FOUR CROWNS - 1983), here using his "Ted Kaplan" pseudonym, WAR BUS is one of the better Italian-made Vietnam War action flicks. The action comes at a steady clip as dozens of people are gunned-down, blown-up or stabbed. There are many surprises along the way, such as the reveal that Ronny is a schizophrenic epileptic (which explains his earlier actions) and that Debrand is a convicted murderer. The three women on the bus have precious little to do except look scared, go skinnydipping or act as romantic interests for the soldiers. There's a scene towards the end where Major Kutran finds a radio in a deserted VC village and tunes to a station playing music and, for a few short moments, everyone on the bus and in town relaxes and forgets the trouble they are in. It's a poignant scene that's unusual in a film like this and foreshadows the tragic events that are about to happen. The final assault by the enemy on the town is well-handled and full of scenes of bravery. WAR BUS tells an excellent story to go along with the action and should satisfy fans of the genre. 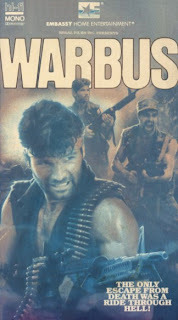 An unofficial (and inferior) sequel, WAR BUS COMMANDO, was made in 1989, starring Mark Gregory (1990: THE BRONX WARRIOR - 1982), the late John Vernon (SAVAGE STREETS - 1984) and directed by Pierluigi Ciriaci (DELTA FORCE COMMANDO - 1987).